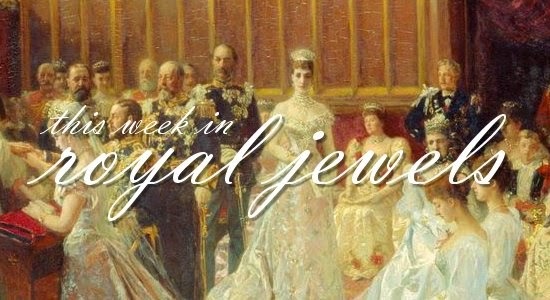 Time for another round of weekly royal jewels! Be sure to cast a vote for your favorite in the poll below! 9. The Duchess of Cornwall wore her signature pearls as she attended a performance by a Colombian theatrical group in London on Wednesday. 8. Princess Beatrix of the Netherlands was also in London this week, marking the 140th anniversary of the King William Fund. She wore gold jewelry for the celebrations, including a bracelet that appears to have a snake motif. 7. Wearing a fun pair of blue earrings, Princess Caroline of Monaco served on the fashion jury at the International Festival of Fashion and Photography in France. 6. After the King's Day festivities ended in the Netherlands, King Willem-Alexander and Queen Maxima traveled to Bonaire, where she embraced the tropical fun in both her clothing and her jewelry. 5. While she wore a large brooch -- the Palm Leaf -- for ANZAC Day, Queen Elizabeth II selected the smaller Diamond Leek Brooch to present new colors to the Welsh Guards at Windsor on Thursday. 4. At the Reina Sofia Awards on Wednesday, Queen Letizia wore small earrings; however, her mother-in-law, the star of the show for the day, wore a large necklace with an elaborate pendant. 3. Princess Madeleine wore a distinctive, sautoir-style necklace of pearls during the Swedish royal audience with Pope Francis on Monday. 2. Crown Princess Victoria selected an intriguing pair of long pendant earrings for the birthday celebrations of her father, King Carl XVI Gustaf of Sweden, in Stockholm on Thursday. 1. Crown Princess Mary brought out a surprising -- yet very appropriate -- jewel for ANZAC Day, debuting her Australian Opal Brooch. She's worn the central opal as a ring on a previous occasion, but this is the first time we've seen it in brooch form. It was a perfect choice for a service commemorating the valor of Australian and New Zealand soldiers.